How to write a Gratitude Journal will help you to learn how to focus on the good things that happen in your life and feel better about it, it’s easy to start it and you will learn how to add some color on it and doodles, to make it your own style! It’s easy to explain what a gratitude journal is, as it’s a journal or a notebook where you can write down things that happen to you or in your life and you’re grateful for.. When you start paying attention to good things happening in your life, it won’t take you long to notice them, even it doesn’t matter if you’re going through hard times in your life. Life can turn hard and it might challenge you to work hard to keep on it sometimes, but even during hard times you can see some good things happening in your life. As you get used to focusing on the good in your life, you’ll find more good will start happening to you, and this is the magic of a Gratitude Journal. What to write on your Gratitude Journal? Anything you’re grateful of, from that little thing that makes you happy to the biggest great things that can happen in your life. From that morning that you wake up on time with no need of the alarm clock to wake you up on time. That cup of coffee or tea that’s perfectly made for you, or your way to your work and you got only green lights all the way! The good moments you notice on your daily life and you never noticed before, there’re are many things going on in a single day, that you might have no time to pay attention to or you might think that it’s normal or it’s just part of life. But, if you take a moment to think that not everyone has the same life, and you might know some people are luckier that others, and that is not just because life is like that. If you believe in the “Secret” or in the law of attraction, wherever you put your attention on, you’ll get more of it in your life. And it works simple as where you put your attention you’ll get more of it. This is why keeping a Gratitude Journal will help you to get the new habit to pay attention to the good in your life and you’ll create more of it. When you get the habit of being grateful you learn how to feel better, happier and stronger. This will have a positive impact on your life. When you get used to practicing gratitude in your life, you’ll notice that envy feeling as soon as you start feeling it and you learn how to avoid it. People who have practiced gratitude for four weeks have noticed life satisfaction, as you keep working to work on your gratitude journal, you will notice more good things happening in your life and you’ll feel better and you’ll gain a better self-esteem. It can help you to keep the bad thoughts at bay, bad thoughts about you and your life can hurt you within time, as you keep focused on the good in your life and yourself, you will learn how to avoid those bad thoughts and emotions that can hurt you. Keeping a Gratitude Journal will help you to live a better life and get better relationships. With the people around you, you’ll be capable to build up a better relationship, your partner, your children, your friends and even with your coworkers. You can improve your friendship with your friends, you will be ready to give social support to other people, build a stronger family relationships. Gratitude can help you to gain personality benefits. As you keep working to write 3 to 5 good things that happen to you every day, you can become more optimistic. You soon will notice that it’s easy to find good things going on in your life you never noticed before, you’ll be ready to grow yourself in spiritualism. As you grow to be more grateful you will notice how your life can go from “self-centered” to ready to give more to others, you’ll notice then you have many things you can give to others you never noticed before. You can notice now you might not need so many material things you though you needed before and it will be easier for you to be optimistic about you and your life. As you get used to noticing the good in your life and record it on your journal, you’ll notice soon that your health can improve day by day. Feeling better about the good things you already have in your life will help you to start feeling better about you and your physical health. You can find a few gratitude journals printed and ready for you to buy, you can get yours and start a four-week personal challenge for you to write 3 good things every day on it. It won’t take long to write three short sentences on your gratitude journal, if you a new to this, you might think it’s hard to find those three things to write down on the first page, or you might think there’s nothing good going on your life today. 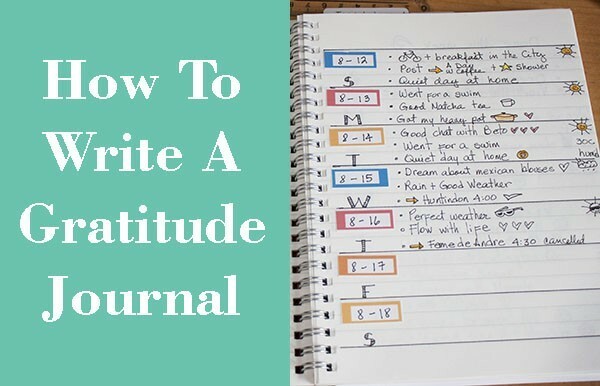 You’re reading this blog post about how to write a gratitude journal, it’s because you have a cell phone, an IPad or a laptop to read it, so that means you have the advice to get in the internet, many people will not read this blog post ever. You can get access to the internet, so you are lucky. You have a roof to sleep under it tonight. You have a meal to eat today. This list can go on and on, your life and mine could be different, but both of us have many things to be grateful. This article includes affiliate links, I thank you for your support, you can read more about my affiliate disclaimer here. What is the best notebook to start a Gratitude Journal. Any notebook will be perfect to start it, if you want to buy one that will have all the spreads ready for you to fill them up, it will be a good idea, and there’s a long list to find the one for you. But if you want to start today, and you don’t want to wait until you get a fancy Gratitude Journal, you can start on regular notebook like I do. You can take a look to the note book I use to write my Gratitude Journal and check its current price on Amazon here. I have switched from a designed layout to a notebook where I prepare the weekly layout for every week, with three lines to fill up. Nothing fancy but it works for me. If one day I don’t fill it out, it’s ok to skip one line or two, or one day; but I do my best to go back to it to keep working on it. I love to work on my journals adding some color on the pages, I found adding some color stickers to write down the date help me to keep working on it. Is doodling a good idea? I love to doodle and I found it give to my gratitude journal a personal touch and it helps me to write down the three things I’m happy about everyday easier and faster. By adding some doodles to my gratitude journal it helps me to add some emotional touch to it. Happy face = I feel happy, happening this today makes me feel happy. Arrows = Going to or I’m happy I went to. Clouds, sun, rain = small doodles about the weather helps me to notice about the weather and feel happy when the weather is good or when the weather helps me to keep working on my goals. Check = I’ve learned to be happy and grateful I can do or achieve things in my life. Adding color to my gratitude journal. By adding some color to my gratitude journal as I work on it, makes it prettier and this motivate me to keep working on it. As you keep writing on your gratitude journal, you’ll notice all the good things that happen in your life, from the smallest to the biggest, and you’ll see how important is to stop for a moment and be aware of the good in your life. As we all have been used to live sourounded with a good deal of good stuff around us, we have lost the ability to notice how important it is to appreciate the things that happen to us, from the moment you can wake up after a good night sleep, the perfect cup of coffee or tea, to have a job (even if it’s not the job you dream of) it’s a job, your group of friends or that best friend, your family, and the good time you spend together. To those amazing moments, the new house, the new car, the new job, welcoming the new member of your family, switch your 9 to 5 jobs to making a full income as a blogger, that trip you planned a few years ago and you just bought the plane ticket!! Everything is important in your life, keep your own gratitude journal and you will be noticing how many good things happen in your life, as you learn how to be happy about the good in your life, you’ll learn how to deal with the bad things that also happen in anyone’s life, and it will be easier for you to go back to enjoy the good things. Feel free to copy my Three Things To Be Grateful for your Bullet Journal or for your personal planner, and let me know how it goes for you. Work on it the first four weeks and read it back, you’ll see how you could find those three daily things your grateful for easily!